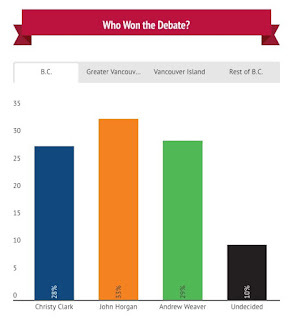 We now have the numbers from Mainstreet post-debate poll, courtesy of the Vancouver Sun. The newspaper is saying that "Horgan won by a slim margin". I disagree. Yes the raw numbers show that but the raw numbers are not what is really interesting. Simply asking people "hey, who won the debate?" is not the best question because people's own political bias will play a role. In particular, Liberal voters will tend to say that their leader, Christy Clark, won. And the same for NDP voters, etc. It's always difficult to be objective to make these judgments. After all, if you already like John Horgan and want to vote for him, you are likely to find that he did well during the debate. So when you see that only 33% of people think Horgan won, this is bad news for the BC NDP that was polling above 40%. 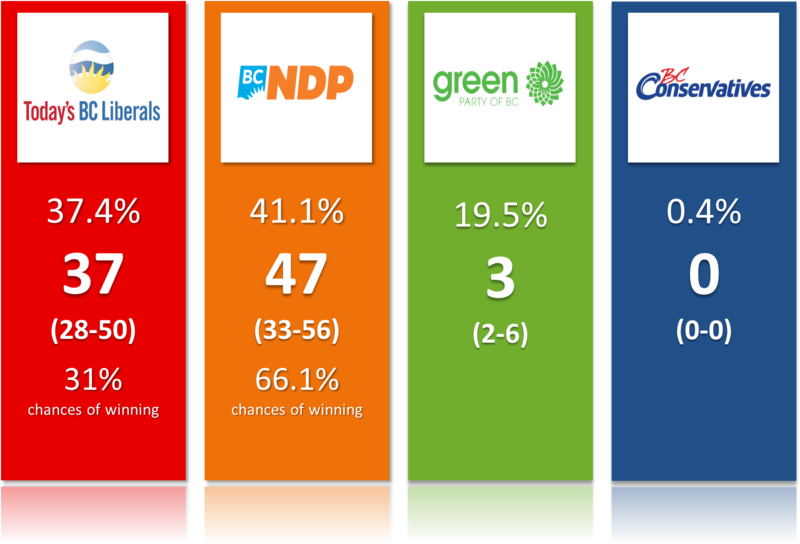 On the other hand, when 29% say Andrew Weaver won, this is much higher than the 19-20% of this party in the polls. This is why I always do my debate leader index (trademarked by me!). It worked fine during the last federal election to predict a rise of Trudeau. 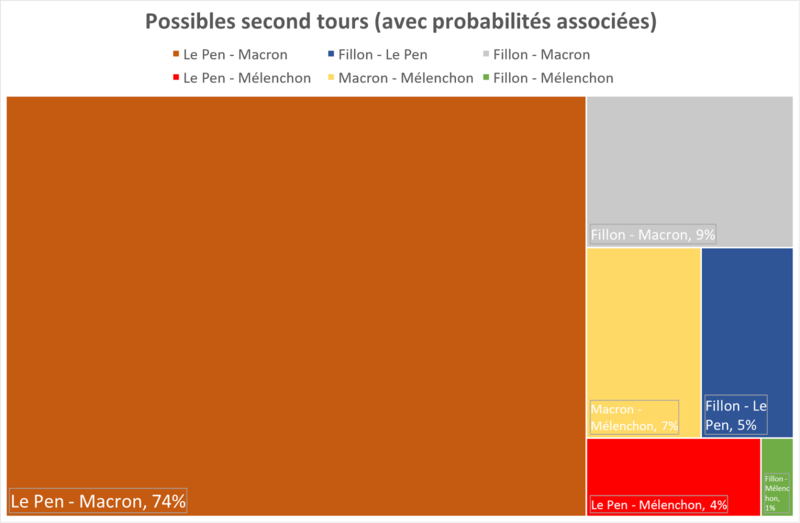 It also worked very well in 2014 in Quebec to predict that Pauline Marois, the PQ leader, actually had had a bad debate and would see her party go down. I find this index as a much more useful measure than the raw numbers. See this index as a more predictive measure of how voting intentions will or could be influenced by the debates. So for the televised BC debate of 2017, here is the index. I have two measures, one is using the pre-debate polling average while the other one is using the voting intentions post-debate among the people who watched the debate. Somebody on Reddit made the comment that the population who watches the debate is different (which is likely true. Prove of that being that the NDP is behind the Liberals in the voting intentions of this poll only), so I should use the second measure. I think there are good arguments for both approaches, so I'm using both. results are very similar anyway. I dropped the undecided for both the voting and winning the debate questions in order to be fully compatible. Remember, an index greater than 1 means you managed to get people voting for another party to say that you won. A score below 1 means that you didn't even convince all the people already voting for you. There is no question that Andrew Weaver won. We already knew that he generated a lot of searches and interest on Google during and after the debate, but we now have another confirmation (or evidence if you prefer) that he "won" the debate. You have people who don't vote Green (at least not yet?) who think Weaver won the debate while you have a good share of NDP voters who even admit Horgan didn't win (using the first approach). Notice however that the measure here might have a bias as I have observed that people tend to be nicer to the leaders of small parties (think Elizabeth May at the federal level). But Weaver and the Green are polling at 20%, they are at times ahead on the Island, they aren't "small" anymore, or at least not currently. Still, the bias might exists. As for Christy Clark, her index isn't good but the same poll indicates that her favourability increased. (the numbers here are terrible for Horgan who ends up being barely more popular than Clark). With that said, the numbers from Mainstreet are hardly an indication that she did enough to climb back in the polls (of course, these polls could be wrong as they were in 2013, but I'm assuming they aren't). Winning a debate is often half the battle. The other half being about winning the post-debate spin. 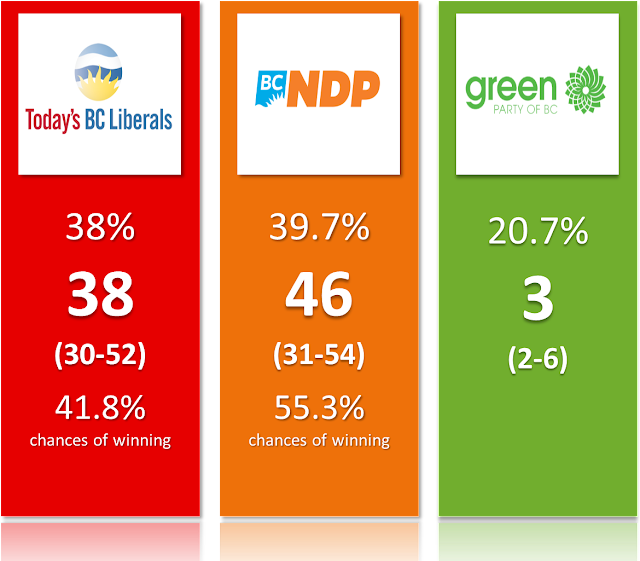 We'll see how the Green and Andrew Weaver will fare in the next few days. But for now, I'd confidently say that Andrew Weaver won the debate. 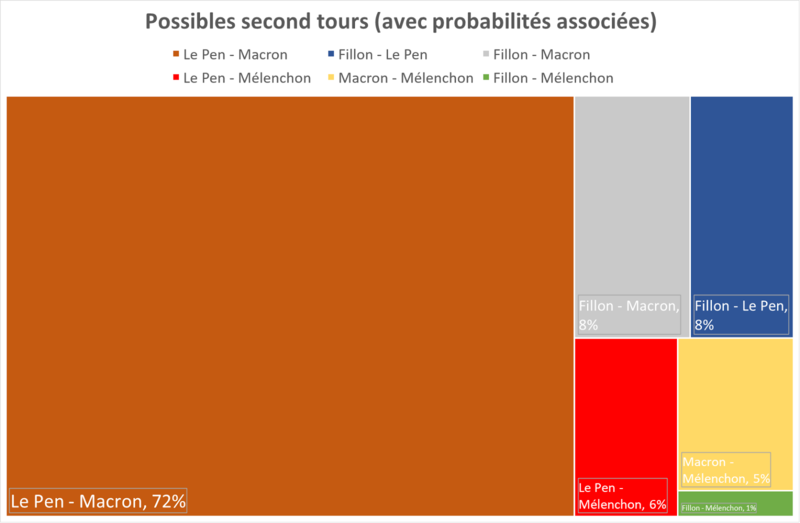 After, there is no guarantee that he (or his party) will indeed increase in the polls in the coming days. But he's the most likely to benefit from his performance. Update: it seems I'm not the only one with this conclusion since the UBC Prediction Market (where people bet actual money) has seen a sharp increase in the number of seats for the BC Green (up to 9 as I'm writing this line). Yesterday was a good day for the polls in France and, by extension, for my projections and myself. 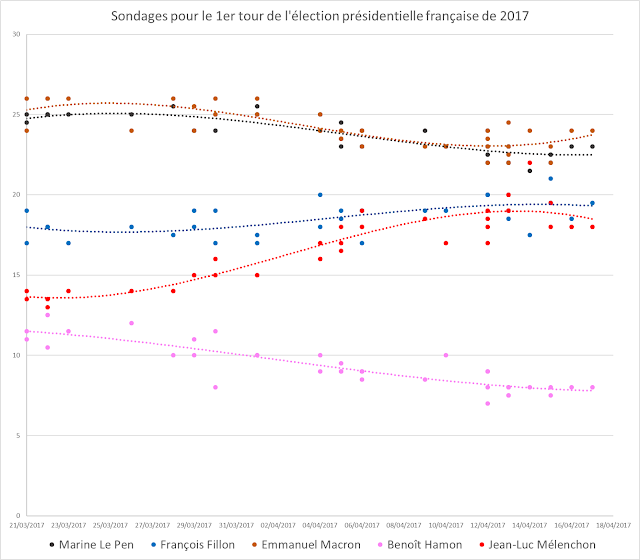 The polls for the presidential election in France were spot on and therefore so was I. To be fair, it's much easier to simply aggregate the polls than to convert them into seats anyway. Let's not forget the BC election though. We haven't had many polls (yet?) but I made some substantial updates to the model. First of all, I took into account where the Green and especially the BC Conservatives were running candidates. 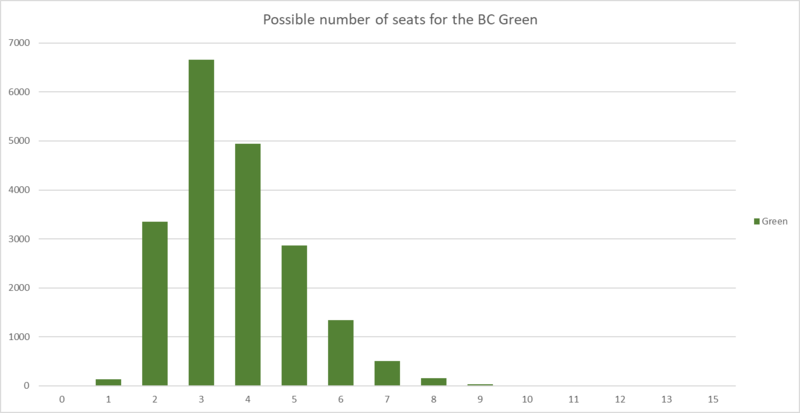 The Green have 83 candidates (out of 87) while the BC Cons only have 10. Honestly I should just drop the Conservative from my projections but they were already included, so it's actually less work to leave them there. I also made some adjustments to some ridings. Some adjustments are coming from the lack of a Conservative candidate (in ridings where this party got over 10% last time around), others are coming because I have reasons to believe my projections were wrong. One such example is in Victoria Beacon-Hill where I previously had it leaning Green. But that was with the built-in bonus of having the Green leader running there. It's not the case anymore and my estimations show Jane Sterk did benefit from a significant bonus. On the other hand, I now have the Green ahead in Cowichan Valley as it appears fairly obvious the Green are running a better campaign than the BC NDP (whose base was kinda split during the nomination process, with the former campaign manager now running as an independent!). 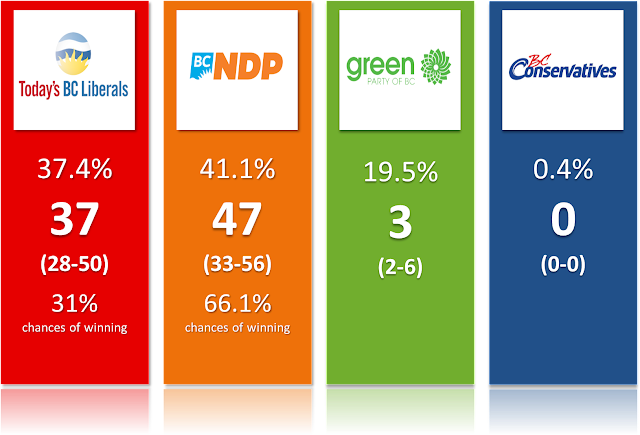 You can find the updated projections on the BC Election 2017 page and you can use the updated model in the simulator. I wanted to try a little exercise related to the French election. 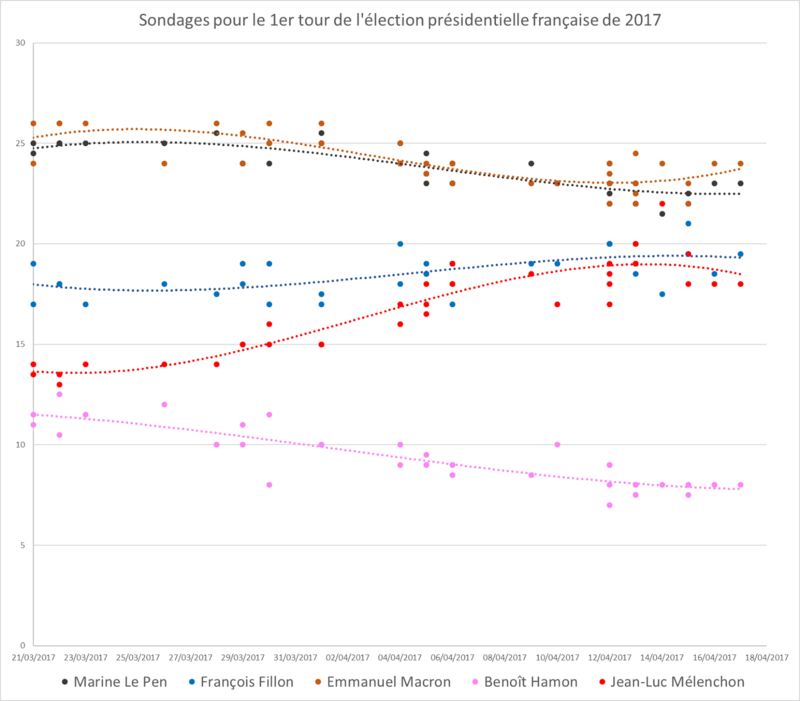 France uses a run-off system where, if no candidate gets more than 50% of the vote in the first round, the top 2 then go to a run-off 2 weeks later. I wanted to simulate the effects on the BC election. To do so, I used my projections as the baseline results and I redistributed the votes of the other parties in every riding where no candidate was getting a majority. I used the second choices provided by Mainstreet and Ipsos. 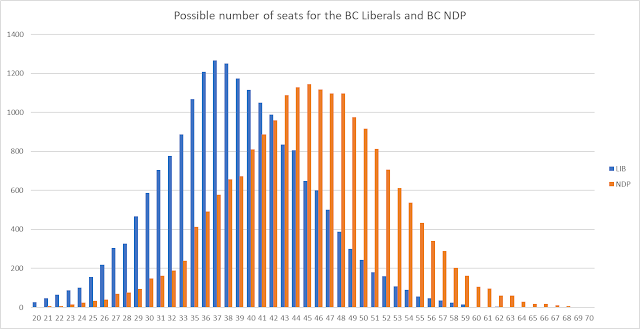 The BC NDP would go from having a small lead to being pretty much guaranteed a majority. For the Green it wouldn't change anything. It's because they are winning their three ridings "comfortably" and they are the main second choice of the main two parties. 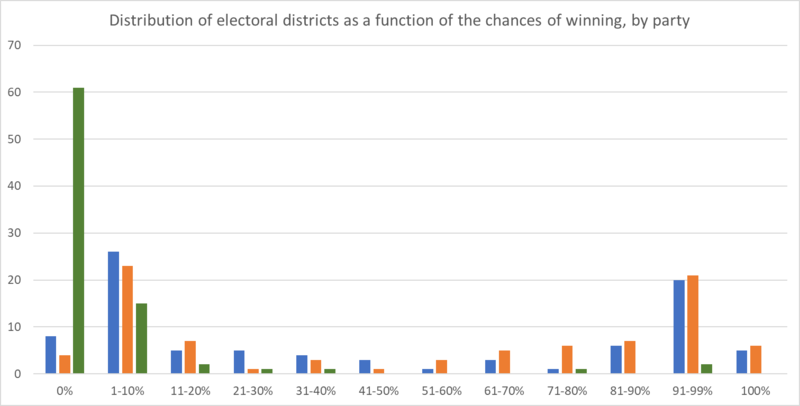 Only 39 ridings are currently projected to have a a candidate over 50%. 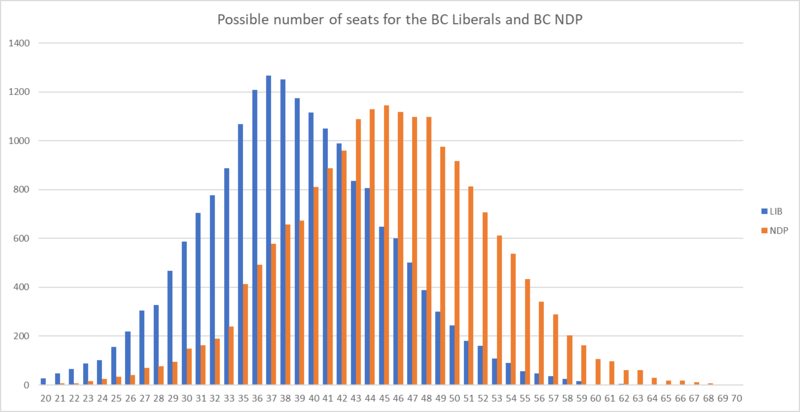 As for being in the top 2 (i.e the run-off), the Liberals qualify 79 times, the BC NDP 85 and the Green 10. 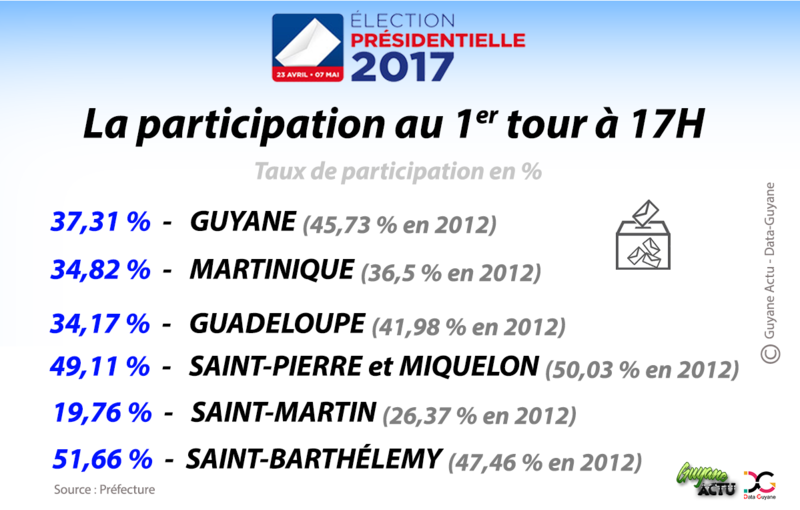 These numbers might seem crazy but remember there are only really 3 parties, so it really limits the possibilities. An example of a riding that would flip from Liberals to NDP with the French system is Boundary-Similkameen. There are 5 ridings affected in total: The one mentioned plus Courtenay-Comox, Maple-Ridge Mission, Surrey-Panorama and Vancouver Langara. I think that beyond the fun exercise, this blog post should illustrate how close this election is. You flip 5 ridings and you have a NDP majority. If it remains really like this until May 9th, my final projections will be quite uncertain.